Why can't I find my favorite truffle on the website? One of the best things about enjoying Gail's truffles is that many flavors are inspired by what's in season, a whim, or a flash of inspiration. That means that some flavors are seasonal or sporadic in their availability. For example, the fresh mint is only available during the summer when it’s growing in Gail's garden. The coconut is usually available when Gail is going to see her dad (it’s his favorite). Because of these daily changes, seasonal flavors are not posted online. Where is a list of your seasonal flavors? You can check out Gail's blog and her Facebook page or follow her on Twitter to learn about the latest flavors. If you have questions, please call us at (608) 249-3500. Better yet, drop by the shop to see our full daily assortment. Can I choose the flavors I want in my Chocolatier’s Choice box? We will choose the flavors for you. If you want certain truffle flavors included, please make a note in the special instructions box during checkout. Are there descriptions of the truffle flavors in the boxes? Yes! Each box contains a menu that helps you match up the truffle topping with the flavor. Are any of your products gluten-free or vegan? Do any contain alcohol? To help you easily identify products that may match your nutrition needs and preferences, we’ve incorporated helpful symbols. Throughout the web store you'll see these icons. Just click any icon to view other like-products. Below is our guide to what these symbols mean. If you have additional questions about ingredients used or any of our products, feel free to check out the FAQ section or give us a call at the shop, 608-249-3500. Our Cointreau and Cognac truffles contain alcohol in trace amounts. Which products are vegan? How do you define vegan? Any item marked with this symbol is considered vegan. We define vegan as items made without meat, eggs, or dairy products. In general, all of our solid chocolates are vegan. Our Allergen Guide identifies which products are vegan, nut-free, soy-free, gluten-free, and/or peanut-free. However, please know that while we do our best to properly separate areas and equipment to avoid allergen exposure, we do not have completely separate areas and equipment to manage each of these allergens and sometimes cross exposure may occur. If you are allergic or severely allergic to soy, gluten, tree nuts, or peanuts, we strongly recommend that you do not eat our products. Your safety is our number one concern. Do you really make everything by hand? Absolutely! We make fresh chocolates five days a week at Gail's shop on Atwood Avenue. Visit us to see for yourself. Why isn’t your chocolate certified organic and fair trade? Certification costs farmers and small-scale manufacturers a great deal of money, making it out of reach for many even though they would qualify. And, unfortunately, organic and fair-trade certifications are no guarantee of quality. Gail makes a concerted effort to ensure that the practices used by her cacao sources are organic and the wages are of fair-trade level or above. For Gail, seeing is believing. She has traveled to Costa Rica, Colombia and Ecuador, living and working with the farmers. She chooses farmers, manufacturers and importers who value biodiversity, sustainable agricultural practices and producing the finest quality ingredients. What is the shelf life of your truffles and solid chocolates? The best chocolate is fresh chocolate. Gail doesn’t add preservatives, which change the flavor and texture of chocolate. For the best experience, enjoy her truffles much like you would bakery items - within a few days is best and definitely within two weeks of purchase. If kept out of heat, humidity and sunlight, our solid chocolates can be enjoyed up to a year after purchase. Store your chocolates in a cool, dry place between 60-70 degrees Fahrenheit. Humidity should be within 45-55%. If your truffles can’t be eaten within two weeks, then seal in a reclosable bag and refrigerate them. When you’re ready to enjoy, slowly return them to room temperature to bring out the full flavor before you eat them. How do I place an order for my wedding or business? Please contact Isaac at isaac@gailambrosius.com or call him at (608) 249-3500 for a detailed quote. If I order online, when will my package ship? While we would love to ship around the world and to our neighbors, both north and south, our business license only allows us to ship within the United States. What do I do if my chocolates arrive melted? First of all, we're so sorry that your chocolates arrived melted! Fortunately, they will still taste just as good. We do our best to ensure our chocolates don’t melt in transit. We package them on ice or expedite the shipping when necessary. Unfortunately, though, Mother Nature can get the best of us and chocolate does melt when the temperature rises over 73 degrees. We can't be held responsible for melted chocolates. How do I redeem my ticket for a chocolate tasting? Please call the shop at (608) 249-3500 to register. Tastings are typically the third Thursday of every month, except in December. Space is limited, so please call soon! Tickets are valid for any of the tastings Gail hosts in her shop on Atwood Avenue. And, not to brag (well, maybe a little), but you are in for some fun! Where can I find your truffles? We love visitors! Please stop in our shop on Atwood Avenue on Madison’s East Side. 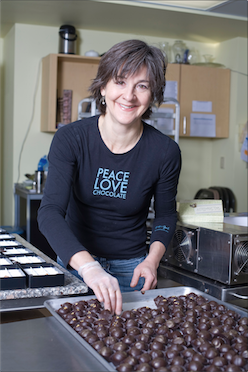 You can also find Gail's chocolates at a number of locations in the Madison area. You can also order online. Why did you choose the Goodman Community Center as your charity? As a longtime resident and business owner in the Atwood Avenue area, Gail has come to know the wonderful services that the Goodman Community Center provides for the neighborhood and much of Madison's East Side. Many of Gail's employees and customers also live in the area, so its continued diversity and vibrance is important to her. The Center moved into a new building in 2008 and has been able to expand its programming even further. In addition to classes and resources for residents of all ages, it provides a gym and fitness center, food pantry and free lunches for hungry kids in the summer. Gail is proud to support this important community resource. This is a beautiful website! Who created such a thing? They each were invaluable to the process -- level headed, bright, and talented all around. Thank you to the Gail Ambrosius staff for their frank and wonderful contributions as well.